An artist's view of the project. 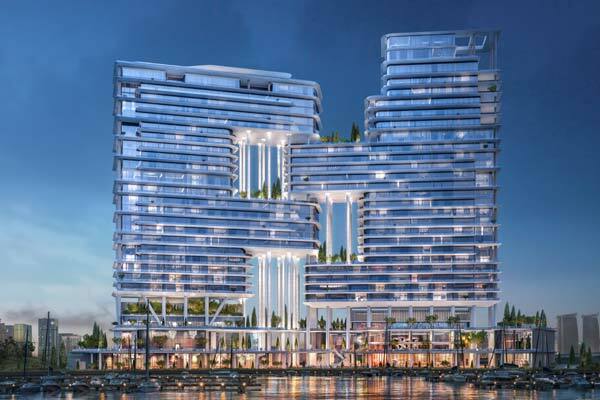 Dubai-based ultra-luxury developer Omniyat has appointed a joint venture between Roberts Constructions and Impresa Pizzarotti & C as the contractor for its Dorchester Collection project in Marasi, Dubai Canal. Situated on one of the widest part of the Dubai Water Canal in the Marasi community, the development includes two towers, which will house the luxury five-star hotel and exclusive residences, high-end food and beverage retail as well as a surrounding mixed-use precinct. The news follows the black-tie event Omniyat held last week to celebrate its partnership with Dorchester Collection and unveil the first images of how the high-end project will look. Designed by renown architectural firm Foster + Partners, the site includes Dorchester Collection’s first hotel in the region and luxury residences managed by the iconic hospitality brand, named Private Residences by Dorchester Collection. “Omniyat is known for creating bespoke developments of the highest quality, with relentless attention to detail when it comes to luxury finishes and appointments. We are also honoured to deliver this project for such an esteemed brand as Dorchester Collection” said Graeme Robson, chief executive, Roberts Constructions. Roberts Constructions has partnered with Impresa Pizzarotti & C SpA to deliver the luxury five-star hotel and exclusive residences in a joint venture arrangement.